Tomato soup is a favorite lunch around here. There are undoubtedly zillions of ways to make it and everyone has a favorite. Roasted Tomato Soup is my favorite. It's easy, doesn't take hours of cooking down to get thick, and most importantly, it's super tasty. I don't have an exact recipe to share but I do have a general process that you can easily duplicate and change up for your personal tastes. I don't worry about type (paste, slicers, etc.) of tomatoes, they all get roasted. If I'm doing multiple sheets and size of tomatoes, I try to group small tomatoes on one sheet and large tomatoes on another, this way I can pull the smaller tomatoes out before the larger ones are finished roasting. Homemade roasted tomato soup that is perfect for immediate serving as well as preserving for winter eating. Cut the tomatoes in half (quarter really large ones) and place cut side down on a rimmed baking sheet. Toss other veggies on there if you desire – peeled, whole garlic cloves, thick slices of onions, halved sweet peppers, etc. Use your imagination and taste buds as a guide. Put the sheets in the oven and roast until the tomato skins start to blacken and the tomatoes have given up a bunch of water. This can take up to an hour depending on the size of the tomatoes and the amount of water they contain. Drain off any of the water still on the baking sheet and let the roasted vegetables cool a bit. Put everything in a blender and puree until smooth. I don’t worry about seeds or skins, everything gets pureed together. Pour the puree into a soup pot and let the seasoning begin. Add salt, pepper, basil, oregano, parsley, truly whatever herbs or seasonings suit your fancy now. Heat through, just to get the seasonings all melded and tasty. If canning, pressure can quarts at 15 pounds of pressure (for my elevation) for 40 minutes. You could serve immediately with a little added milk or cream, if you like. You could can it. Because of the onions and green peppers in my recipe, I pressure can quarts at 15 pounds of pressure (for my elevation) for 40 minutes. The canned or frozen soup is delicious reheated (again add milk or cream when reheating if so desired) and makes a great packed lunch with some homemade crackers or bread. Let me know if you do try it please and how it worked for you and what you did to make it own. I canned 24 jars last year… I gave most as Christmas gifts. My hubs was mad because he loved it. I added baby spinach under my tomatoes to roast. It tasted like an expensive Italian soup. Awesome recipe, I started canning again today, shooting for 48 jars this year! This looks so yummy! Thanks for sharing with us over at the Homeacre Hop! I’ll be featuring it on this Thursday’s Hop! Sounds delish! Thanks for sharing on The HomeAcre Hop! I featured your post today! Hi….I just had to let you know that I made a small batch of this roasted tomato soup today and I can’t stop licking the spoon! My poor DH is not going to have any by the time he gets home for supper. 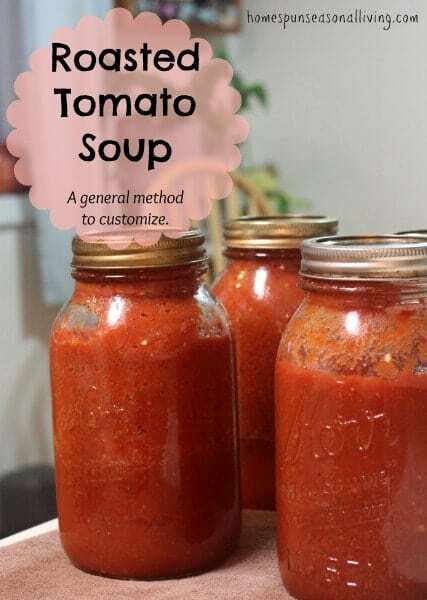 I used some plum tomatoes I had as well as an onion and 1 red pepper that I needed to use…and the flavor is delicious just as it is! I’m not sure if I even want to add anything to it! Thank you for sharing…I will certainly be making more of this soup in the future! I’m so very glad that it turned out so well for you. Thanks for letting me know! Fantastic recipe and a great way to use up end of season Roma tomatoes….roasted a few garlic cloves along with the tomatoes (skins on with seeds intact too), pureed in blender, dumped into Stockport then added salt, garlic powder, Italian seasoning and heavy cream. Served with a sprinkle of grated parmesan cheese and croutons….family loved it and now want more! Had to go get more end of season Roma’s ……thankfully we had a great tomato crop this summer here in Northwest Ohio. Thx for a great idea!! Yum! I’m so glad you found this useful. Can I safely can soup with feta in it? I love roasted tomato soup with feta mixed in, but I don’t always have the cheese on hand. Maybe it would get mushy? Canning of dairy products isn’t considered safe – so no. Add it later. YUM! I’m so doing this to have a quick lunch for me & the kids. Great post & description of your process. I’ve made tomato sauce with peppers and onions and water bath can safely. Any reason why you pressure can your version? I would love to roast tomatoes before canning but don’t have a pressure canner. I’ve never had problems with using onions and peppers. Thank you! Peppers, garlic, and onions can bring down the acidity level meaning it’s too low acid to safely can in the water bath. You could test each individual batch with litmus paper to be sure it’s high enough acid to be safe in the water bath. Even so, most sources like Ball and the USDA say water bath tomatoes need to be acidified with lemon juice or citric acid, because the acidity levels in tomatoes can vary widely. Better to be safe than sorry. Can you offer an estimate on amount of tomatoes by weight in order to get a pint or quart of soup? About 10 pounds will probably yield abut 7 pints – give or take, depending on the tomato and how thick you make it. Thank you! I have been canning, Tomato sauce, crushed tomatoes, salsa and the tomatoes keep on coming. Tonight we are having this soup and home made wheat bread for dinner. I roasted the tomatoes with onions and garlic and I plan on adding fresh basil and fat free sour cream. A little salt and pepper too. I may end up using my pressure canner and make this for winter, it really smells awesome in my house right now. I’m so very glad to hear that you’re enjoying it! canning some today–using my fresh tomatoes and am excited to taste your yummy recipe! I have made a similar but have not canned it. Thanks so much for sharing. Hi! I’m currently roasting my tomatoes for this deliciousness and its been about 30-40min.. The skins are black but no water has been released. Should I let them continue to roast? It could be that they didn’t have much water to begin with or much of it evaporated in the oven. Once the skins are black, I would remove it to prevent burning. Let cool for a bit and see if any more water releases. Okay great! Sorry for the duplicate comment. I don’t know how to delete it ? Can you give me more of the ratio of onions and garlic to the tomatoes? Say 4 gloves and 1 onion per tray of tomatoes. Also, i love basil. Should roast the basil too or put it in the blender fresh with roasted veggies? I would say your ratio sounds about perfect. I would put the basil in the blender fresh… It might get bitter if left to roast too long with the veggies. Have you ever done pints with this recipe? How long would you pressure can them vs quarts? Thanks! Pressure canning would depend on the ingredients in your soup. If there are peppers pressure can at least 35 minutes at a pressure that is suitable for your elevation. Always pressure can for the ingredient that needs the longest processing time. Made this for first time today, just scrumptious. I’m sure it will now be a seasonal favorite. Used half an onion and 3cloves garlic per pan. Added fresh basil and parsley after blending. Saved the drained water for thinning as we don’t want milk or cream. Thank you much. Love this recipe….made a tomato basil soup….great with a grilled cheese sandwich on a winter day.